From his birth in 1880 to his death in 1945, Rene Lalique single-handedly redefined glass making and modern jewellery. In 1908, a chance meeting with the perfumer Francois Coty began a creative partnership which paired the beauty of fine fragrance with exquisite glass perfume bottles for which Lalique is famed. By the 1920's and 30's, Lalique was creating perfume bottles for all the great houses - Roger & Gallet, Houbigant, Molyneux, d'Orsay, Molinard, Worth, amongst others. Inspired by its solid roots anchored in the world of fragrances due to its famour partnerships with the great perfumers, Lalique created its first in-house fragrance, Lalique de Lalique in 1992. There are 5 products in the range for you to explore: you are viewing page 1 of 2. Nilang is like a Zen paradox of contrasts - freshness and sensuality; a crisp fruitiness balances by rich floral notes. A perfume in which the world of the senses is explored in every facet. Amethyst is a feminine line inspired by Rene Lalique's 1920 creation The Collection of "Epines" bathroom accessories. Its name, its design, its colour, its fragrance...are the encounter between jewellery and nature. Lalique has drawn upon treasures from its crystal making heritage and is insprired by the Cactus Loose Powder Case, created in 1928 by Rene Lalique and now a prestigeous re-released classic. Le Parfum is another great classical and timeless creation. Elegant, rare of exceptional quality, Le Parfum is a true luxury product rightly positioned in the Woodforde's selective universe of "Haute" perfumery. Pictured above is "Sillage", the new 2012 Limited Edition Crystal Extract flacon. Introduced by Marie-Claude Lalique in 1994 to celebrate the birth of her new fragrance, these signed and numbered limited editions have become an annual event, eagerly anticipated like a vintage wine. 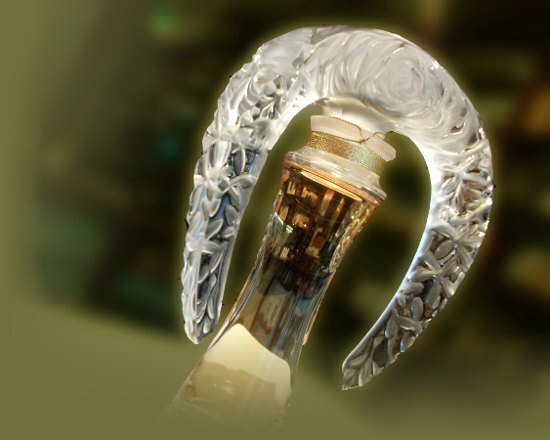 The flacons are the glassmaker's chance to showcase their art in creating and finishing curves and sculpted details. They are produced at the Lalique workshops (at Wingen-sur-Moder) by Lalique's master craftsmen. This year's stunning new flacon "Sillage" can be viewed at our Sidmouth shop.